Data Driven Wins the Axiom Awards! Proud to announce that my book, Data Driven, has won the 2019 Silver medal for best Business Technology book! In August of 2007, Jenkins Group launched the Axiom Awards, “recognizing and promoting the year’s best business books.” Now, 12 years later, they have announced the winners of the 2019 Axiom Business Book Awards, honoring this year’s best business books, their authors, and publishers. A Google Hangout with Eric Picard, CEO of RareCrowds; Chris Scoggins of Datalogix; Andy Monfried, CEO of Lotame; and Chris O’Hara, author of Best Practices in Data Management. Hosted by Stefan Tornquist of EConsultancy. A conversation with Jim Delaney, COO at Marketwired; Graeme Noseworthy of IBM, and Chris O’Hara. Stefan Tornquist of EConsultancy hosts. Mark Zagorski, the CEO of data management platform eXelate has worked with dozens of big marketers to help them put all kinds of data to work, including their own. As a marketer, it is likely that you have access to a great deal of data, and maybe even the kind of big-data we’ve been hearing so much about. CRM data grows every day; point-of-sale data gets easier and less expensive to store; tag-collected data from websites and social sites expands daily; and there is a seemingly infinite amount of third-party data available for purchasing and mixing in with your own. The modern CMO must find a way to value the data assets she has, learn to listen for the real signals among the noise, and find a way to put that data to use. Mostly, that means understanding customer attributes, what drives them to transact, and how much it costs to get them to do so more frequently. In many ways, data-driven CMOs face two challenges: Firstly, winning the internal battle with the CTO to get access to disparate data sources, and bringing them together in a way that creates the opportunity to glean global insights; and secondly, building the platform that enables them to normalize many discrete data types, query that data quickly, and “activate” that data to produce a sales outcome. Think of a large, global consumer products organization. A company that sells soap suds around the world may have up to 20 regional operating companies, and as many as 200 separate datacenters throughout the organization. Within all of those data silos are digital stories of marketing success and failure. Imagine if you could duplicate the promotional dynamics that drove a 20 percent increase in Italian diaper sales across the entire global organization, or leverage the learnings that one operating company had when a key discounting scheme failed? These types of insights can be obtained when the CMO asks the right questions, and when he has data management platforms behind him that can make it possible to get the answers. Being a data-driven marketer isn’t about how much data you can centralize in a single platform. The data may be big, but ultimately the data you store is only as valuable as your ability to extract insights from it — and act upon it. Digital marketing evolves quickly but, for those of us working as digital marketers or publishers for the past 10 years, we have seen distinct waves of transformation impact the way we use data for audience targeting. Early on, audience data was owned by publishers, who leveraged that data to control pricing for premium audiences. The Network Era quickly supplanted this paradigm by leveraging tag data to understand publishers’ audiences better than the sites themselves. Buying targeted remnant inventory at scale created new efficiencies and easy paychecks for publishers, who found themselves completely disintermediated. The DSP Era (which we are still in) continued that trend, by completely separating audiences from media, and giving even more control to the demand side. Today, the “DMP Era” promises a new world where publishers and advertisers can activate their first party data, and use it for remarketing, lookalike modeling, and analytics. The ubiquity of third party data (available to all, and often applied to the same exact inventory) makes activating first party data more valuable than ever. Doing so effectively means regaining a level of control over audience targeting for publishers, and being able to leverage CRM data for retargeting and lookalike modeling for the demand side, as well as a deeper level of analytics for both sides. If there has been one huge takeaway from my conversations with all of the stakeholders in the data-driven marketing game, it is that getting control and flexibility around the use of your own first-party data is the key to success. As a marketer, if you are buying more segments than you are creating, you are losing. “Being a Wave 4 company implicitly means that you are able to leverage the existing sunk cost of these companies’ investment,” says Picard. That means building apps on top of AppNexus’ extensible platform, leveraging Hadoop to process 10 billion daily transactions without owning a server (as Bizo does), or simply hosting portions of your data in Amazon’s cloud to gain speed and efficiency. As digital marketing becomes more data intensive, knowing how to leverage existing systems to get to scale will become a necessity. If you are not taking advantage of this new technology paradigm, it means you are using resources for IT rather than IP. These days, winning means applying your intellectual property to available technology—not who has the biggest internal stack. One of the most interesting aspects of data management is how it is impacting traditional notions of CRM. In the past, digital marketing seemed to end below the funnel. Once the customer was driven through the marketing funnel and purchased, she went into the CRM database, to be targeted later by more traditional marketing channels (e-mail, direct mail). Now, the emergence of data-rich social platforms had actually created a dynamic in which the funnel continues. Once in the customer database (CRM), the post-purchase journey starts with a commitment beyond the sale, when a consumer joins an e-mail list, “friends” a company’s page, follows a company’s Twitter account, or signs up for special offers on the company’s site. The next step is an expression of social interest, when the consumer agrees to make public his “like” for a company or brand by “friending” a company’s page, following a company’s Twitter account. Beyond the “like” is true social activation, wherein the consumer actively (not passively) recommends the product or service, through commenting, sharing, or other active social behaviors. The final step is having the consumer sell on your behalf (directly via affiliate programs or, in the softer sense, as a “brand ambassador”). This dynamic is why Salesforce has acquired Radian6 and Buddy Media. For digital marketers, going beyond the funnel and activating consumers through social platforms means understanding their stated preferences, affinities, and that of their social graph. Most companies already do this with existing platforms. They real key is tying this data back into your other data inputs to create a 360 degree user view. That’s where data science and management platforms come in. If you are not ingesting rich social data and using it to continually segment, target, expand, and understand your customers, you are behind the curve. One trend that is dominating conversation across marketing and wider business practices, is big data. How we measure it, how we store it and how we use it to inform the work that we do. We spoke to Chris O’Hara, domain expert on platform technology to find out about big data, why it’s important and how it is changing the marketing world. Q Why is big data such a big deal and how did it get that way? A: I think the term “Big Data” is getting thrown around a lot lately. There’s “data” that’s maybe too big for some companies to handle, and then there is truly “BIG DATA,” like you would find in the human genome, or Google search. The simple fact is that data has gotten a lot cheaper to store, and infinitely easier to access. Q: Why and how is big data moving us toward a more integrated marketing approach? A: The largest change is not that data is being used to drive advertising creative and placement; it is that the data is available immediately, and that creates the opportunity for optimization. I think we are still in the early days, though. Most marketers and publishers are content to use off-the shelf 3rd-party segments to define and target audiences, rather than plumbing the (infinitely more valuable) depths of their own, first party datasets. Take large CPG companies who maintain databases all over the world. In one large company, you might have as many as 200 large databases, across dozens of operating companies all over the world. It is likely that those datasets have never been directly connected, and certainly it is highly unlikely that this data has never been stitched together and plumbed for insights. The data equation in marketing is quite simple: the more an advertiser knows about you, the better you can be targeted. The real question is whether or not the effort and expense of such targeting is worth the incremental yield that targeting produces. As data gets cheaper and the cost of accessing diminishes, it is obvious that data starts to create real value for marketers. Q: How is the era of big data changing the practice of digital marketing? A: One of he biggest ways that data can help is in terms of avoiding waste. Before large amounts of data could be processed easily, there was no easy way to find out, as an example, what an advertisers’ unduplicated reach was across channels that include mobile, video, game consoles, and the Web. The so-called “sciencification of marketing” is real. If you look at Terence Kawaja’s famous logo vomit slide of the digital display advertising landscape, it is clear that it is 100% driven by data. The underlying data is mostly audience-based, but there is also ad performance data, search data, engagement data, longitudinal data, and attitudinal data driving digital marketing these days. On the direct marketing side, the transition from using mailing address data and surveys to target households to using IXI financial data to target online audience members via a cookie is not so different. Direct marketers can judge performance in real time with conversion data, and now brand marketers can leverage real-time engagement metrics to measure success. Q: What are some examples of big data in integrated marketing? A: The applications to use data in marketing are virtually unlimited. We are moving into a world where everything is interconnected, and we are surrounded by devices that transmit and store data constantly. These days, your supermarket partners with a brand to start a campaign on television, and that drives you to their website, to download a mobile coupon code that goes to your phone, and is used at the checkout line. Your purchase data is then stored, churned, and used to inform the next campaign. A better example of a big data approach to marketing (well, integrated digital marketing) is Google. Ingesting your search habits, video preferences, e-mail content, social network, mobile activity, and internet browsing habits takes a lot of expensive data storage, but it seems to be paying off for Google! Q Which companies are jumping into the big data business and how will this help (and hinder) us? A: In the digital marketing space, you are going to see almost every progressive network, exchange, and data provider stake their claim to helping advertisers and publishers leverage their data. Some of them will be bigger than others. When it comes to managing truly huge amounts of audience data, there are very few companies that have managed to do it outside of the “big five” (AOL, Yahoo, Facebook, Google, and Microsoft). If a company truly has big data (petabytes, terabytes, or exabytes) then you need database software that can scale infinitely, and be able to query massive tables of data and return a result quickly. In marketing, that is starting to mean “real time,” which is not only a software challenge, but a hardware and logistical challenge as well. Marketers should look for a DMP that has actual experience working with massive data sets specifically for marketing applications. Q What implications will digital marketers face with this big data trend? A: Just because the data is there, doesn’t make it meaningful. These days it is possible to get a near real-time view of your audience at the creative level for digital display campaigns, but how many marketers can take advantage of the overwhelming amount of data that they receive every day beyond enabling a DSP to “auto-optimize a campaign, based on a single metric, such as conversion rate? Marketing insights that are driven by churning huge amounts of data are only as useful as the marketer’s ability to react to execute against them. That is why you are going to see the technology platforms that specialize in advertising execution team up with data platforms to try and get advertisers a true 360-degree view of the consumer that can be acted upon. 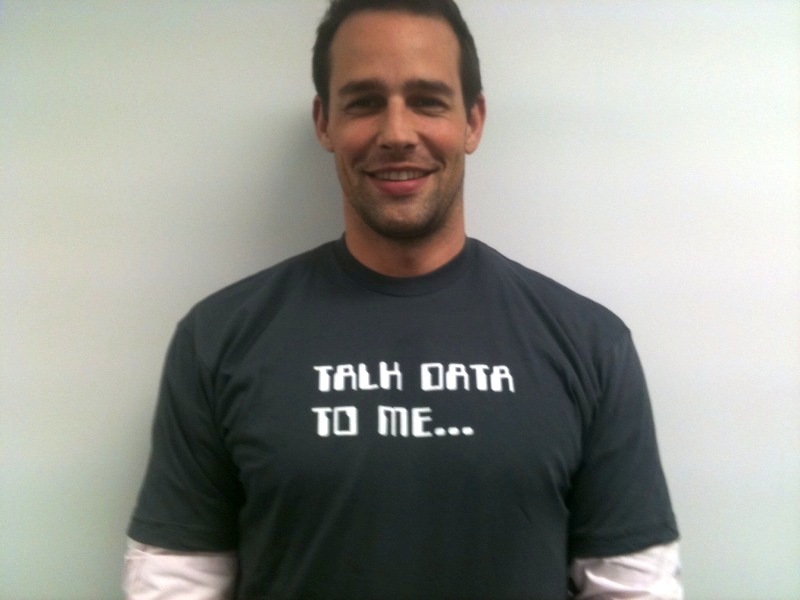 Q How can marketers leverage big data without being overwhelmed by it? A: Try and learn what data is valuable and what is not. Even though I bought a new car 18 months ago, I am still bombarded with Volkswagen ads every time I check my email. Whoever is buying my “auto intender” cookie isn’t really getting their money’s worth, are they? My advice would be to perform a “data appraisal” that focuses on your own first-party data and see what you have. Even if your daily data is measured in gigabytes rather than petabytes, there is always something to leverage. 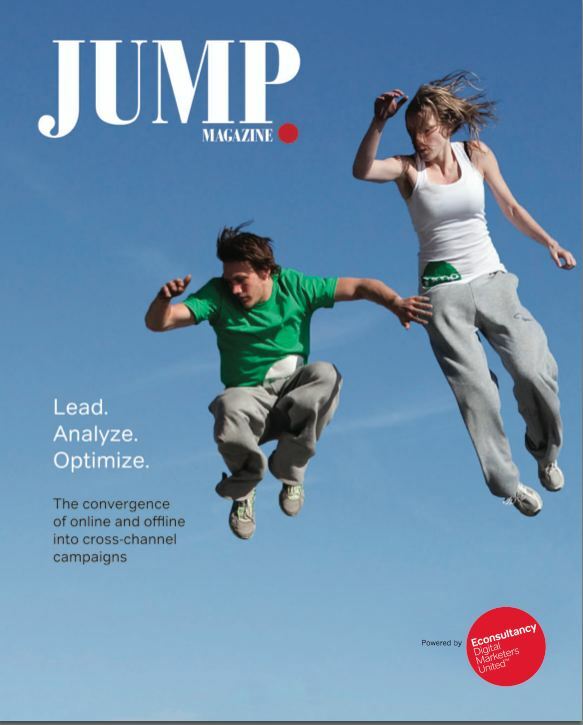 This appears in the current edition of eConsultancy’s Jump Magazine, which you can download here.